“Regency England stands defiant against Napoleon. Skilled in the seduction of men, both mortal and immortal, Narcise Moldavi is the greatest weapon in her twisted brother’s war among the Dracule. Until she falls for Giordan Cale. Her first searing encounter with Giordan brands them with a passionate love. 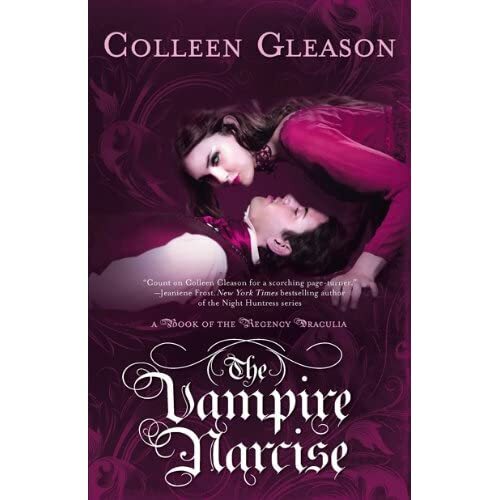 But Giordan’s vow to help Narcise escape her brother’s rule is followed by a betrayal more agonizing than sunlight. Maybe I should have waited longer between Dimitri and Narcise. Because Dimitri, oh Dimitri. It was by far the strongest book. Maybe I would have preferred this more form Giordans POV. I have no idea. I liked Narcise. I understood her. I think the transitions were too jarring for me, the jumpy timeline was intrusive. it seemed every break was one week later. two weeks later, ten years later, etc. It just seemed choppy and was really a bit annoying to me. I really felt like all these scenes were tossed in a blender and spit back out. Beyond that. I didn’t understand what was happening. I *think* something was said about Giordan being special in the Voss book, but don’t remember, whereas all other aspects that transcend the novels are repeated throughout. Reading this one it seems that it was the last and most difficult to piece together from the existing timeline. I liked the interaction with the whatever it is that speaks to each of them, Voss’ woman, Dimitri’s bookseller. We were really left wondering with the cat and what was happening with Giordan and I would have liked more about that. I still feel very confused about what happened differently there and why. Sure sometimes there is no why, but the why was answered in that respect with the other two, this one is just. Missing. We don’t have the Giordan story, it is just thrown in, like so many facts that we just have to accept. But the story was in the search and I missed that. I really didn’t like that whole thing. The difference between them and Voss and Dimitri intrigues me, but the backstory really was lacking for me, the vintage and her dude came out of nowhere, and it really didn’t sit well in my eyes. I am frustrated. I guess that much is obvious. Dimitri was so well done, the build from the previous book was perfect, the tension in his book was palpable and spot on. It just really unravelled for me in this one. There was too much story for the book. So much that wasn’t told, or was just glossed over. Suddenly they are back from Scotland. What? NO. sigh. Plus, why can’t they go in through the armpit? Just saying. I was stuck in this book from the beginning, waiting for it to get pulled together like the other two. I didn’t throw my iPad across the room, but I did toss it on my pillow at the end because it was over, and I was all confused. WFTckry abounds in this one, my eyeballs are dizzy from rolling. I want to say… something else. I don’t know what. I love Gleason’s writing, and her characters. I desperately wish the book was different, but for every one of me there will be a hundred of me who love it dearly without a doubt and that makes me smile. There was a beutiful story in there somewhere, I just couldn’t get past the befuddlery to get to it. It has to be just me because the other reviews are fantastic. I am going to re-read the series rapid fire and see if that makes it better. Perhaps it was that the other two were much more intricately entwined. ugh. I dunno. What do you think? As for the cover, it is just kinda meh. Dimitri should have the red cover. Aside from that, the dude is asleep on the cover. That is NOT hot. And honest to God sidewise must be a regional dialect thing, but I am not going to pick it up.